Between the hellish Other Worlds and the Real World of Zarth is the grey netherworld of The Shroud. While most of the Shroud is comprised of featureless bleak hills, endless corridors, and dreary mist filled forests there are the occasional landmark. Strange castles filled with dead warriors, aquariums filled with dark fish or ruins of cities infested with ravenous Others are chilling examples. Travel between these locations and Zarth is hazardous and random. While being distinct and logical in themselves they often have no fixed location in the Shroud, so travelling there in any predictable way from the Zarth is next to impossible. Only long forgotten rituals of the Ancients, themselves locked in deep dangerous dungeons, can with any certainly facilitate travel. There is also the worry to even the most insane Sorcerer that such rituals in the past have caused cataclysms as such as the opening of the Locust Star, where plagues of Others have taken advantage of the breach between Zarth and the Shroud and have come over to feed. The only known ‘safe’ way is the following Magic Item. While alive Oskmas was a frequent traveller in the Shroud. It is unknown if it was necessity or mere curiosity that drove him to find out more and more forbidden knowledge about this shaded realm. During his life he had every location he visited symbolically represented as tattoos on his skin. By all accounts by the time of his death his body was black with inked markers. Death found him in the form of the Sorcerers of the buried city of Magragore, who slew him on behalf of the Sultan of the Shade City. The Sorcerers then had his skin cured, folded and held in a golden chest in the deepest vault in Magragore. It is rumoured that Sorcerers also preserved Oskmas’s essential salts in an a sapphire jar. Some versions of the tale say that the salts were used, and the fleshless screaming thing that guards the chest is Oskmas. Who ever possesses the skin can use the map to instantly travel within the Shroud to the location pointed at with a special enchanted bone wand, found in the chest with the skin. Achievements are handed out by the Crypt Keeper as rewards at the end of the adventure in addition to XP and treasure. 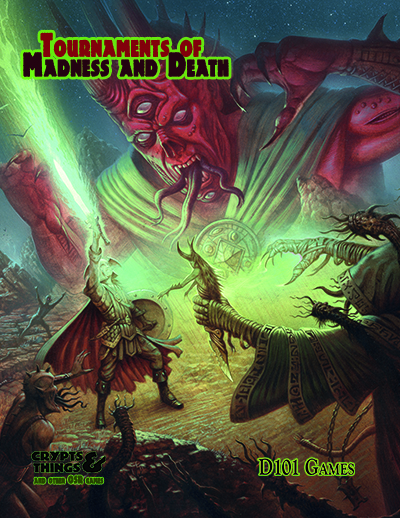 They are partially to reward key points in the Adventure, but also to make up for the fact that unlike regular D&D, with its mass of magic items, there is no mechanism for imparting bonuses and extra abilities. Achievements can also celebrate events in the scenario as well as being tied to specific locations. Mostly give to hit, damage, skill or saving throw bonuses, with occasional special abilities or benefits. +1 bonus to saves/skill rolls/to-hit etc. Small very specific new abilities. e.g.. From Blood of the Dragon. Minor: Ape Killer, +1 to hit Giant Apes (Awarded to the Player who killed the most Battle Apes during the adventure). Minor: Understanding of Battle Apes – can recognise the signs of Battle Apes (tracks, spore etc.) and have a rough understanding of their culture. Minor: Navigate dangerous spaces. +1 to any skill rolls or saves when moving through corridors where there is a danger of collapse. Freedom of the village of Cragspire. +2 bonus to saves/skill rolls/to-hit etc New abilities with broad application. The stuff of legends, powers outside of the normal almost magical in nature e.g. max damage with a particular weapon, always hits with sword, always acts first in combat. 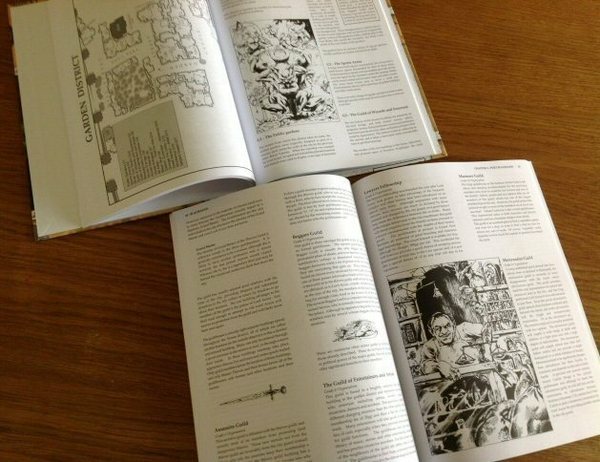 Antony Brotherton over at his Roleplay-Geek blog is compiling a links list comprised of UK OSR Blogs…. Are you UK based? – Do you know what Tizer, Irn-bru, Jaffa Cakes, Kinghtmare and The Adventure Game are? This is a chance for us UK based gamers to band together and fight the good fight using our unique sense of humour, quaint accents and stif upper lips. Welcome to Fiendish Friday, a new feature here where every Friday I shall post a snippet from “Pandora’s Box” for Crypts and Things and other Class/Level based games. “My gods, a rat that big should not exist!” I thought. Then it turned to face me, still nibbling on Jaren’s severed arm. Then it hit me. The rat had a face. What abomination of Black Magic was this! Enraged I ran it through. It squeaked pathetically. I stepped back and wiped its blood of my sword. It was then that I heard a multitude of squeaking from the dark entrance of the sepulture. I knew then that the rat’s brothers and sisters were coming to eat! Standing just over four foot, Man Rats are fast-moving rat-human hybrids, who spend much of their time scratching around for food. Created by the Serpent-Men during ancient times, they escaped the laboratories where they were born in and now infest the surrounding areas. They commonly live in small burrows, but are just at home in ruins and tunnels alongside their smaller brethren. They attack in groups and while they have vicious claws and bite are natural cowards if numbers are not on their side. Although ancient as a race, this product of foul Vivimancy is still prone to instability and each individual has a one in ten chance of bearing 1d4 Khaos features. Intelligence wise they are equivalent to a dog, but are often tainted by madness (3 in 6 chance). Speaks gibberish in Common tongue. Knows a random 1st Level spell that it fires off immediately upon being attacked. Runs around blindly lashing out at anything in its way if threatened. Facial expressions falsely give the impression of high intelligence. Will go straight up to any character and beg for food.